How Long Can a Dog go Without Food – How to Tell If Your Dog Is Sick or Lost His Appetite? A human body can survive without food for more than three weeks. After all, Mahatma Gandhi survived 21 days of complete starvation. We cannot go as long without water, however. Dogs, on the other hand, cannot survive that long without any food. There are different reasons why your dog might refuse food. So when you notice your dog is not eating, you start to wonder, how long can a dog go without food. In some cases, it is even good to leave your dog without food for a day. That way, your dog will be hungry, and he will listen to your commands more because he is eager for the treat and food you give him as a reward. That being said, it is important to know the difference between a dog that refuses food because he doesn’t like it, and a sick dog who just lost his appetite. Refusing food is one of the first signals of sickness in dogs, and if you notice it, you should take your pet to the veterinarian. So, why is your dog refusing food? And how long can a dog go without food? We’ve got the answers. 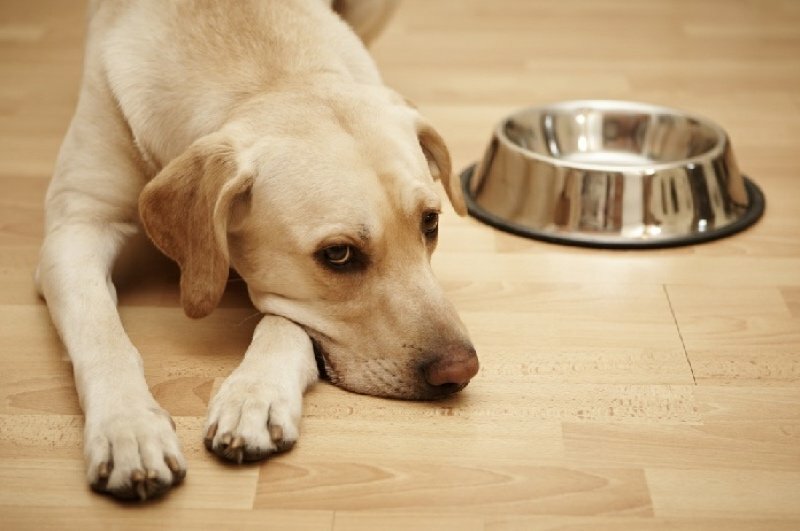 Why is your dog refusing food? Dogs hide symptoms when they are sick. It is an evolutionary aspect. Dogs, as they descend from wolves and other pack animals in the wild, know that sickness and symptoms of it are a sign for a “weak link”. Weak animals are an easy meal and target for other animals in the wild. Our domestic dogs have maintained this evolutionary trait. Hiding an illness is one of the most common reasons why dogs refuse to eat. It is dangerous, but that just the way it is. The problem is, by the time your dog refuses to eat or drink water, the illness or injury might have progressed to a severe condition. In some cases, dogs refuse food because of dental problems. When your dog is suffering from dental issues, it makes it painful and difficult for him to consume food. Take a look in their mouth to see if there is any dental issue. Now let’s breakdown every issue why your dog might be refusing food. The first thing you need to do when you notice your dog is not eating is to recall when was the last time he had food. If you have a good memory, great. You should not panic for the first 48 hours unless your dog is showing other symptoms of illness and injury. For example, if your pet is vomiting or experiencing diarrhea, that is a clear sign he is sick. Those are symptoms accompanying his lowered appetite. Visit the vet right away without waiting any more. You can also check for symptoms to see if your dog has an injury or other illnesses. Press your pet’s belly to see if it is hard, or if your dog is in pain when you push it. Check his gums to see if they are moist and pink. Last, look for signs of dehydration to see if your dog requires medical attention. Is everything OK with their food? In some cases, dogs refuse to eat, simply because they do not like their food. Or if there is something wrong with his food. Check your dog’s meal, and see if there is a problem. When you change your dog’s food to a new formula, it is quite normal and logical for dogs to refuse it for the first time. Some dogs might refuse food altogether. When checking the food, look at the appearance and scent of the food. See if the food smells like it usually does. If it smells rotten, you should give your pet a fresh supply of dog food. Some dogs, on the other hand, have a more sensitive digestive system. They experience allergies and cannot process all foods. If your dog has a problem with a certain ingredient in the food, he can sense it, and will refuse the food. Look for a formula that is designed for dogs with a sensitive stomach, and see if that resolves the issue. There are also many behavior problems that can cause your dog to refuse food. Behavior issues are challenging and tricky to figure out. We know stress is the root of all problems. Many diseases, conditions, and illnesses are caused by stress in the human world. In the canine world, stress also plays a huge role. Even a small change in routine can affect your dog and cause stress. Dogs are animals that live by routine. When there is any change, your dog might be upset and stop eating. Changes that can affect your dog include moving from one house to another, taking a vacation, introducing a new member in the house, and more. So, how long can a dog go without food? Now that we’ve answered all of the causes why your dog might not be eating, let’s answer the final question, and that is how long can a dog go without food. The length can be affected by different factors, including age, physical health, mental health, time of the last meal, hydration levels, and whether the dog is sick or not. With that in mind, a healthy dog can survive without food between 3 and 5 days. If you have a puppy or an older dog, that is not the case. The time a puppy or elder dog can go without food is considerably smaller. Just keep in mind, if your dog goes a day or two without food, he will eat more when he finally starts eating again.